If you've read the first issue of Archie vs Predator you'll know that despite the preposterous premise this new Dark Horse Comics miniseries featuring the squeaky-clean kids of Riverdale and the galaxy's deadliest hunter is the best of both worlds. In issue two, Predator is in town and he's determined to paint the town red...with blood! Alex de Campi deftly maneuvers Archie and the gang into action horror territory while keeping what's made them fun and lovable for over 75 years. Archie vs Predator is funny as you'd expect but still the bone-chilling, spine-removing thriller associated with a ruthless killer. This is evident within a couple of pages as one longtime ancillary character gets his head blown off. De Campi sets the tone early and you never who's going to get it next. Things escalate quickly as news spreads about a killer on the loose in Riverdale. The book takes on a tone of a B-movie horror flick of the 1950s like 'The Blob' where the townsfolk foolishly think they can kill the monster with conventional weapons. If anything being armed to the teeth only makes them targets. The Predator has this funny anti-weapon stance except for himself. He's a little misunderstood that way. 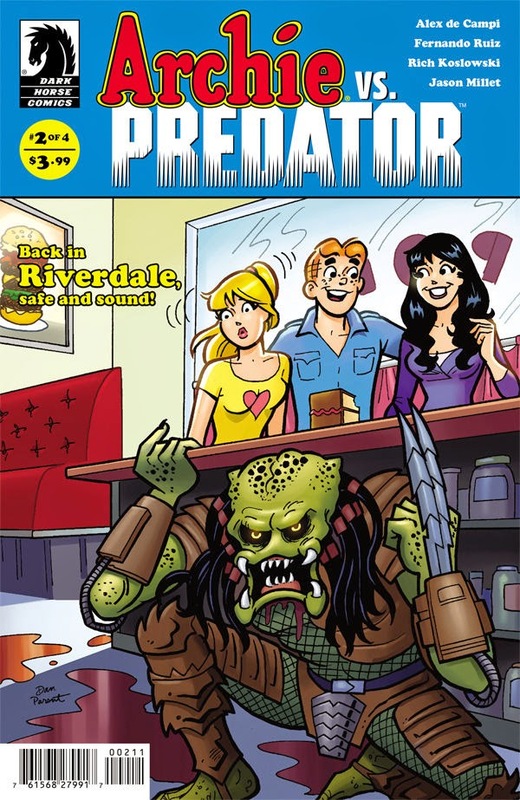 Betty is taking the lead on this series because she thinks she brought this horrific curse of the Predator to Riverdale while they were on the island in the first issue. She seeks the help of Sabrina, who takes a clever poke at Afterlife with Archie, despite Veronica's constant ridicule. All the classic Archie characters are on hand and no one is safe. Fernando Ruiz's wonderful Archie house style art adds a wickedly morbid splendor to all the brain and blood splatter. For many fans, seeing Veronica covered in blood will be a hoot. Although, there is a creepy male gaze undertone when she needs to change clothes in one scene. I'm giving Ruiz the benefit of the doubt for now as it could have been just the parodying of a horror movie trope unless it was something more insidious. Archie Vs Predator is a fun and exciting thrill ride with all the humor of the Archie Comics and the blood and gore of the Predator movies. It's a potent combination that brings to mind movies like Scream, Last American Werewolf in London, with a little Sharknado thrown in (Archie Vs. Sharknado is already in the works, seriously). It's only a four issue miniseries so get this now!